What was my thought here? Well, hold on and I’ll try to lead you through my convoluted thought process. I was thinking about getting up close and personal with a post on electric DIY projects, maybe even slightly intimate. Sounds like fun, right? The problem is that there are many things we DIYers will try but electric is an area that most of us shy away from. Look, for years if I couldn’t fix a light fixture by replacing the bulb then doggonit that light fixture is probably broken beyond repair. There can’t be another explanation. If I need to flip a switch half-way and wiggle it a little bit to make something work, well that’s normal. Right? No, my good DIYers, it isn’t! But I will try to cut you some slack. That is why instead of getting intimate with electric we are going to dip our toes in the pool. More like a speed date rather than getting intimate. I know, a little weird but it works in my mind and this is my blog. So there you go! So, what is our project going to be? Answer: Checking outlets to make sure they are wired correctly and that our GFCIs work as intended. This project also gives us an excuse to buy a tool or two and who doesn’t love that?!?! “Do you really need to buy that gadget Travis?” “Yes, honey. I need to make sure all our outlets are safe for you. I worry about you and cherish your safety!” Bam, new tool! This is an inexpensive one though. I won’t give a brand name but they are easy to find at hardware stores and home improvement stores. The first one is called a 3 prong outlet tester. Get one that has a button which will trip GFCI outlets to test them (A GFCI is that fancy outlet in kitchens and bath, also some garages and basements as well. They should be installed within 6′ of water sources, ie faucets, and in possible damp locations, ie basements and garages.) You should only be spending $5 or less for this. The second tool you will need only if you find some problems but you might as well buy it with the tester since you convinced your significant other that their personal safety is dependent on having said tools. 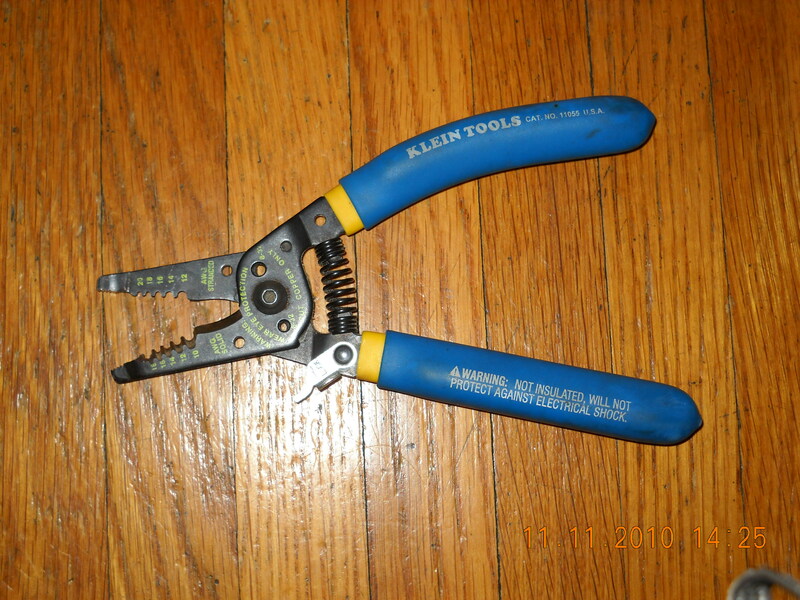 This is a wire stripper/cutter. I like the brand Klein and it should only be about $10. Heck, your spousal unit probably spends more than that on lattes (Feel free to remind them of this unless, as is the case with me, you easily outspend them with your own caffeine habit and your beer snob ways). Now go shopping!! One of my 3 prong outlet testers with a GFCI test button on top. Your back, cool. Pop that tester out and take a look. If it comes with some directions and you want to be a real tool nerd, by all means give them a good read. I usually “save” them for when something doesn’t work like I thought and then I refer to the directions. And by “save”them I mean throw them away and then dig them out of the trash later when I realize that I can’t figure the thing out. It’s your call though. 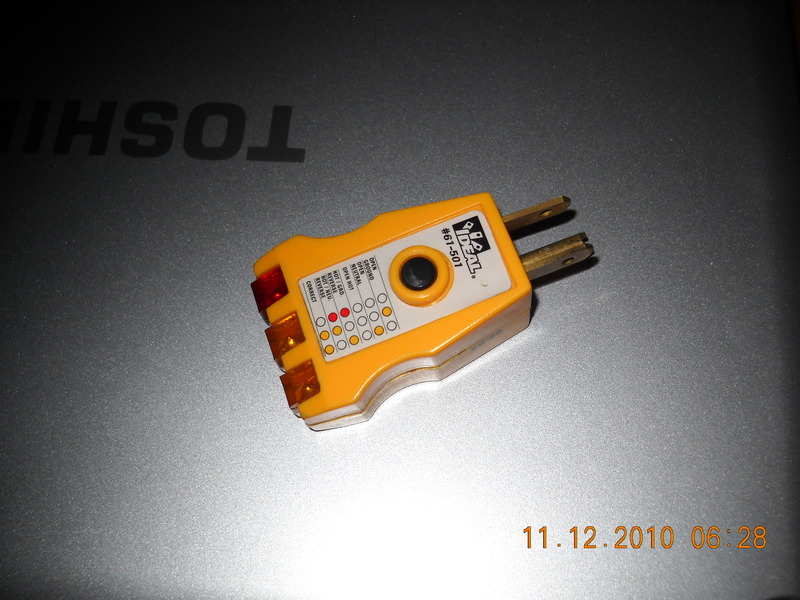 What this particular tool does is test your outlets by plugging into them and lighting up certain indicators. Best case scenario is that the two yellow indicators light up and you are good to go (Worst case scenario is nothing lights up. I guess that’s not completely correct. You could plug in and short the outlet out, things could spark, there could be a fire. But don’t let me scare you.) It also will test a GFCI (That fancy plug again) by plugging into it and pressing that button on the top of the device. It should trip the GFCI outlet and you will then have to reset it. This keeps you safe in case you do something like drop your hairdryer into the sink when it is full of water. It will shut off the electric to the hairdryer quicker than two shakes of a lambs tail (Gotta love those old colloquialisms). The second purchase is your wire cutter/stripper. Much less to explain here and I really do have faith that you will figure this tool out without my help. Again, if you really need that much hand-holding, the price is a 6 pack of a good IPA (shout out to Anderson Valley Brewing!) and I will gladly come over to explain the intricate workings of the cutter/stripper. Now more than likely this will benefit people living in homes built before the, oh, let’s say 60s. What are some of the issues you will find you ask? Well, you may find that you have tons of 2 prong outlets which is a bummer with today’s electronics. You definitely should not be using that adapter that is sold to get around the 2 prong outlet with a 3 prong device. This leaves your fancy schmancy electronic device ungrounded and unprotected if there is a power surge. Another issue that I commonly see when doing home inspections is ungrounded outlets. The middle yellow light will light up and that is it. This issue is the same as the 2 prong outlet. The other issues are variations of ungrounded outlets, mixed up wires (hot/neutral reversed, etc) or no power at all. On to the good stuff, what in the world do we do? For the most part, today’s current wiring has 3 wires. They call it 2 wire because everything needs to be difficult and confusing but that’s just my opinion. So, you may hear someone talk about 12-2 or 14-2 wire. This wire is actually 3 wires, a bare copper ground, a wire in white plastic called a neutral and a wire in black plastic called a hot wire. 14-2 is typically used on lighting fixtures or outlets which do not get heavy use. 12-2 is commonly used for kitchens and baths. I know, very basic explanation but if you want to know more just go to the library and check out a home improvement book on residential wiring (I LOVE the resources for this kind stuff at the library, BTW. They even have videos on some of this stuff!) 12-2 is thicker than 14-2 and this is the last I’m gonna say on this topic. I’m going to cover how your outlet SHOULD be wired and this SHOULD cover most problems. You will have to leave me a comment with your specific problem if this doesn’t help. If you are switching your 2 prong outlets to 3 prong, go buy some 3 prong single gang outlets (Just ask at the store for what you need, there are tons of choices. I recommend going to a neighborhood hardware store if possible for this. The people are usually a bit more knowledgeable than the 12 year old at the big home improvement store who was working in plants the week before but has been moved to the electric section because it is cold now!). These outlets should cost about .80 apiece. If you have an older house with ungrounded outlets but they are 3 prong, go to the hardware store and buy a foot or two of bare copper wire. Just buy the 12-2 size, it’s harder to bend but will cover the 14-2 need as well as the 12-2 wiring needs. Now, TURN OFF THE ELECTRIC TO THE PROBLEM OUTLET AT THE PANEL! Trust me, you will shock yourself. The bummer is when you touch your tool (store bought one you dirty bird!) to the hot wire, shock yourself and then melt a spot on your brand new wire cutter/stripper. Take off the cover plate and put that aside. Now, remove the outlet. You may need a light source since the power being off may disable your lights. Grab a flashlight and make it easy on yourself. Take a look at the wiring. There will be a certain amount of figuring out things by yourself as it would be impossible to cover EVERY variation. You should see a black/hot wire to the gold or bronze colored screw, a white/neutral wire to the silver screw and the bare ground wire to the green screw. This is the best case scenario but one you will not find since you determined that you have a rogue outlet. Let’s be serious though. If you didn’t have a problem outlet you wouldn’t have had an excuse to buy some tools so rejoice in your screwed up outlets! If your house is from the 70s and up, you probably just have a loose wire and need to reconnect things. I actually have seen this before. The electricians just didn’t attach things properly and the wires worked loose. Go ahead and reconnect. If it is an older house you will probably just see a hot wire and a neutral, no bare copper ground. The previous homeowner along the way stuck in a 3 prong outlet for modern devices but didn’t wire it correctly and because of this the outlet “works” but isn’t grounded. You would never have known this unless you tested it with the 3 prong outlet tester, you can thank me publicly in my comment section and you are welcome! But seriously, what to do? Barring gutting your house and rewiring everything, I will let you in on a little electricians secret called “bootlegging”. As stated before, I am not a licensed electrician. This is where the piece of bare copper wire comes in handy. You are going to hook the end of the bare copper wire around the green ground screw and cut off a short section that will go over and hook around a silver spare neutral screw. This way any wayward electricity that goes through your third ground plug leg will be sent over to the neutral and back to the box. After that it will be grounded to the earth through the grounding rod which grounds your electric panel (Hopefully, but this is another post or an answer to a readers question if someone brings it up). There, now you have a 3 prong outlet that will protect your device. Screw the outlet back into the wall and turn on the electric to test before you put the wall plate on just to make sure it is testing correctly. Below is a link to a short video tutorial. Hopefully I will learn to embed the video instead of this link so it looks slicker! I can rewire an outlet but this computer stuff is sometimes confounding!! Also, there is a short finishing tip video which will follow next week. My Vimeo account was maxed out for the week. Fixing outlet problems. from Travis Moyer on Vimeo. OMG, this was way more involved than I expected. I truly hope that you could muddle your way through this and possibly have it help you. Again, if you run in to any specific problems, don’t understand something, want to regale me with stories of your triumph over your electrical problems, etc just drop me a comment.